The retexturing BMOVEMENT PLATINUM has innovative features and high performance technology. With Blueberry extract has antioxidant benefits the retexturing has a soft color that blends the hair while while aligning the strands. Reduces the volume gradually, making the blond hair look natural, protecting the color and removes the yellowish as well. 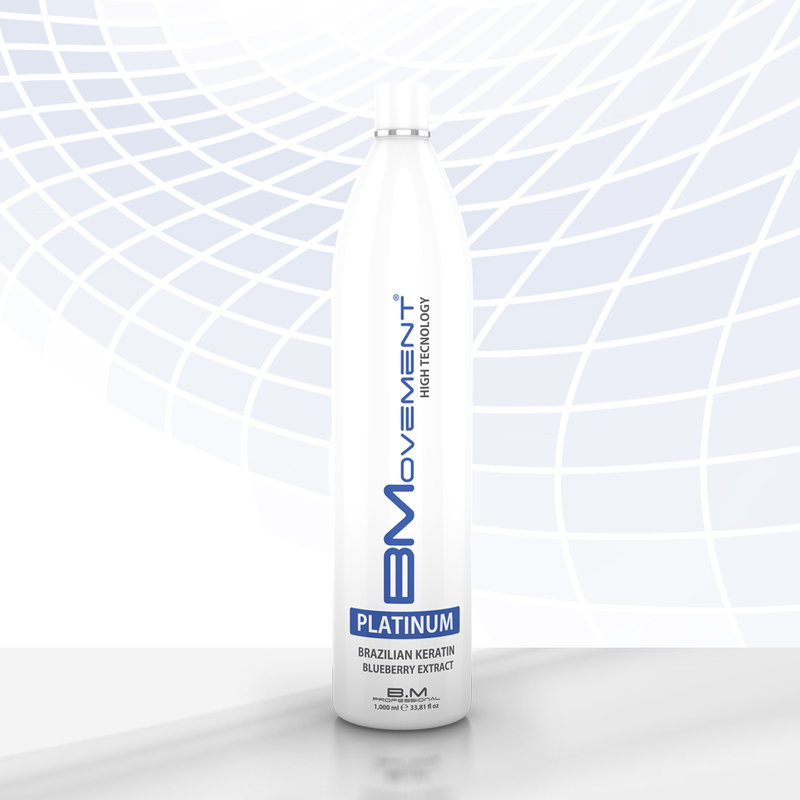 Directions: On hair which 50% wet, apply the BMOVEMENT PLATINUM with the help of brush. Avoid touching the scalp. Spread the product evenly to the ends. If necessary, use a comb gently for a better distribution. Let it sit for 10 minutes and dry with the help of a blow dryer. Brush well. Use a flat iron with maximum temperature of 450F ° / 230C ° (Always apply a heat shield before use the flat iron) into thin strands. DO it slowly until the hair is completely dry, aligned and shiny. Modo de uso: Com o cabelo 50% úmido aplique a BMOVEMENT PLATINUM com o auxílio de um pincel. Evite encostar no couro cabeludo. Distribua uniformemente até as pontas. Se necessário, utilize um pente delicadamente para melhor distribuição. Deixe agir por 10 minutos e seque os cabelos com a ajuda de um secador. Escove bem. Utilize uma prancha com temperatura máxima de 450F°/230C° (Sempre aplique um protetor térmico antes de pranchar os fios) em mechas finas. Proceda lentamente até que o cabelo esteja totalmente seco, alinhado e com brilho. Composition: Water (Aqua), Cetearyl Alcohol, Glycerin, Cetrimonium Chloride, Polysorbate 60, Isopropyl Palmitate, Cyclopentasiloxane, Dimethicone, Hydrolyzed Keratin, Polyquaternium-7, Vaccinium Myrtillus Fruit Extrac, Disodium EDTA, PEG-180M, Methylchloroisothiazolinone, Methylisothiazolinone, CI 60730, Fragrance (Parfum), Amyl Cinnamal, Amylcinnamyl Alcohol, Benzyl Benzoate, Butylphenyl Methylpropional, Citronellol, Eugenol, Limonene. WARNING: External use only. Avoid contact with eyes. In case of contact with eyes, wash with plenty of water. In case of irritation, stop using the product and seek for medical care. Keep the product away from light and heat. Keep it away from chidren.